In true Mandy style this entry is two days late, but as the saying goes: better late than never, right? With my semester coming to a close, my brain has been battered, pummelled, and mercilessly stuffed with information from assigned scholarly articles and textbooks. All of which will ultimately be forgotten by the final period in my endless essay, or answer in my final exam. In other words, my brain is worn out. Exhausted. It feels like a balloon that has been emptied of its air and fallen onto the hard, cold floor after flying all over the place in a frenzy because its purpose in life is to be an air-filled balloon but some idiot decided to release its air and reduce it to its original state as a distant cousin of a condom. There’s something deep and metaphorical in there, but I can’t make the connection. Anyways, anyone who ends the semester saying otherwise is full of shiitakes. With that said, even though I’m mentally exhausted I’d still appreciate a good read, albeit something lighter than Roland Barthes’ theories on intertextuality and postmodernity. Fortunately, I’ve found the perfect book to begin my vacation. 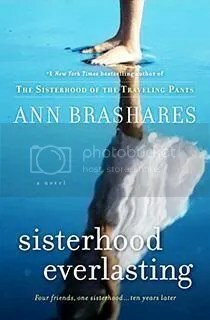 Ann Brashare’s newest installment in The Sisterhood series is entitled Sisterhood Everlasting. As a teenager I devoured these books and could not wait to read about the summer adventures of Carmen, Bee, Tibby and Lena and wish I could have a magical pair of jeans that fit perfectly while making wonderful things happen. It goes without saying that although I was completely taken by surprise at the ending of what I thought was the final installment of The Sisterhood; I also felt that it was a fitting end to a wonderful series. Things change, and people grow up. Like me, these four girls grew up and were now starting a new phase in their life. It was a bittersweet end, but I knew I could revisit these characters by picking up one of the books, dusting it off and sitting comfortably on my couch and relive their adventures and the memories that they bring back of my own teenaged summers spent under the sun. So imagine my surprise when I stumbled upon Sisterhood Everlasting the newest addition to the Sisterhood series! I’m not sure what to expect from this newest installment, but with ten years separating the events of the last book from this one there are bound to be major changes with the four girls, or should I say women, that I grew to know. However, I can’t wait to start reading this book and hopefully enjoy it as much as I enjoyed the others. Here’s to the Pants! Remember: Pants=Love. Love your pals. Love yourself.